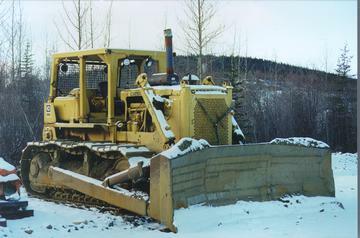 This is a picture of our old 'muffler cat' bedded down for the winter at our placer gold mine in the Yukon. This sturdy old powershift D8 is in daily use through out the summer months despite its 34 years. This tractor was sold new to the Macmillian-Blodel Company by Finning Tractor in Vancouver, British Columbia and spent its early working life as a grade cat in the big timber country of Vancouver Island. It has been working in the Yukon at our placer gold mine since 1986. It is in a stock condition with the exception of a D8K muffler to reduce the bark of the old straight exhaust and is still started with the 2 cylinder gasoline 'pup motor'. The Hyster D89B winch still operates as new and the Cat 30E U-Dozer has recently been reconditioned. It is a testament to the products of the Caterpillar Tractor Company that this machine is still productive after all these years! Thank you for the opportunity to share our pride in this good old Cat.